Yup, it's pretty much who you thought it was. Gaming is as popular as pet ownership—two-thirds of American households include at least one person who plays video games for 3+ hours per week. (They tend to) younger, have high school diplomas or Associate degrees, and be male. In 2015 $91.5 billion was spent on video games and gaming products around the globe. Video game makers may have untapped audiences in older individuals and women – and dentists. In 2015 nearly $91.5 billion was spent on video games and gaming products around the globe, with the United States accounting for nearly a quarter of that ($22 billion). In the same year, global movie box office revenue brought in only $38.3 billion. Gaming these days is just as popular as pet ownership—two-thirds of American households include at least one person who plays video games for 3+ hours per week. While typically associated with teens, the industry has expanded to include diverse audiences, producing games aimed at children, older adults, and niche interest groups. To find out who’s playing, we analyzed the age, income, education, and gender of video gamers based on anonymized data from tens of thousands of applications for student loan refinancing from Priceonomics customer Earnest, a loan provider. Earnest’s data is based on our applicant pool and does not represent the national picture, but rather a subset of people with student loans. In order to be considered a “gamer” in our analysis, individuals had to have at least three gaming purchases (transactions containing keywords such as GameStop, Steam, Twitch, Nintendo, etc.) that totaled more than $20 in approximately two years of spending history. 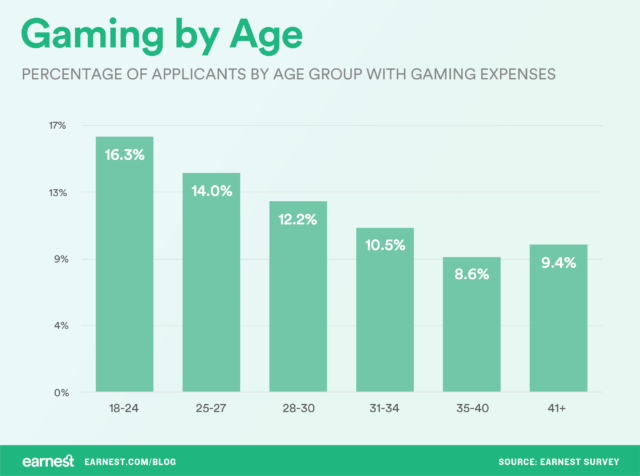 To begin, we looked at the percentage of applicants in various age intervals that have made gaming purchases. Overall, the percentage of applicants who spend money on video games decreases with age. The youngest age group, applicants aged 18-24, has the highest percentage of gamers. About 16% of applicants under 24 have made video game purchases, followed by 14% of applicants aged 25-27 and 12% of those aged 28-30. There is a small increase in gaming for applicants age 41 and older, which could reflect purchases made for children or a renewed interest in playing video games. Are applicants in certain professions more likely to make video game purchases than others? To find out, we looked at the percentage of video gamers with various degrees. Applicants with high school diplomas were the most likely to make video game purchases, followed by applicants with Associate and Bachelor’s degrees. Applicants with advanced degrees are less likely to be gamers than those with four-year or shorter degrees. 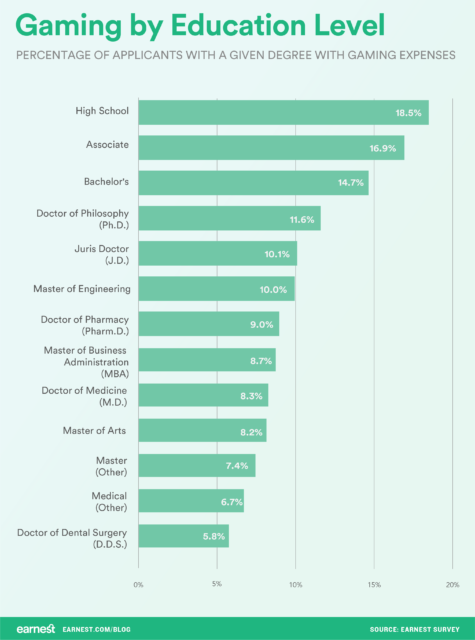 Of the advanced degrees we looked at, applicants with PhD’s and JD’s were the most likely to be gamers, while dentists were the least likely to make video game purchases. 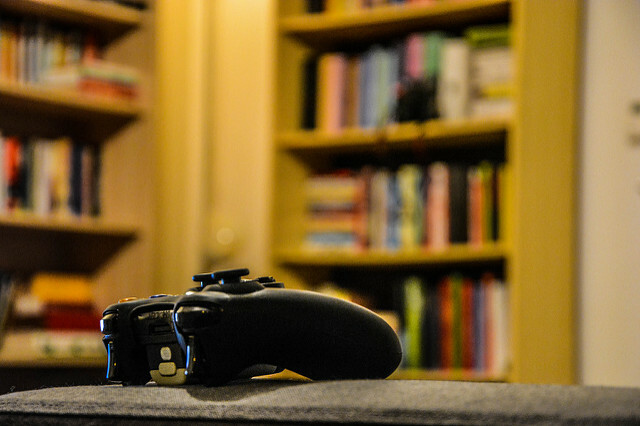 The correlation between advanced degrees and fewer video gamers could be a result of age. Applicants who have completed a DDS or MD tend to be older, having completed 8-10 years of class after high school, compared to four years for a Bachelor’s and two years for an Associate degree. Applicants with more advanced degrees tend to have higher incomes. Does that mean that those with high incomes are less likely to be video gamers as well? 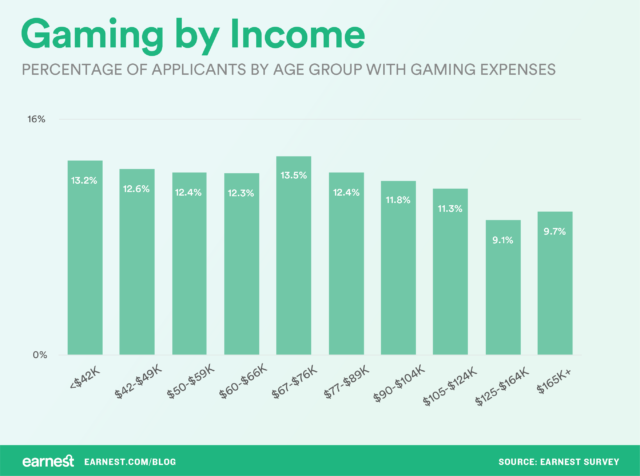 We looked into the percentage of applicants with gaming purchases by income group to find out. The percentage of applicants with video game purchases by income group is fairly consistent across the board. Income doesn’t make a big difference in video gaming, though there is a small but notable decrease in video gaming in applicants who make more than $90,000 per year, where the share of video gamers begins to drop off from 12% to 9%. Could this be tied back to the effect of age on video gaming? Are applicants who make more than $90,000 further into their careers and in an older age bracket? Next, we looked at the percentage of gamers by years since graduation. 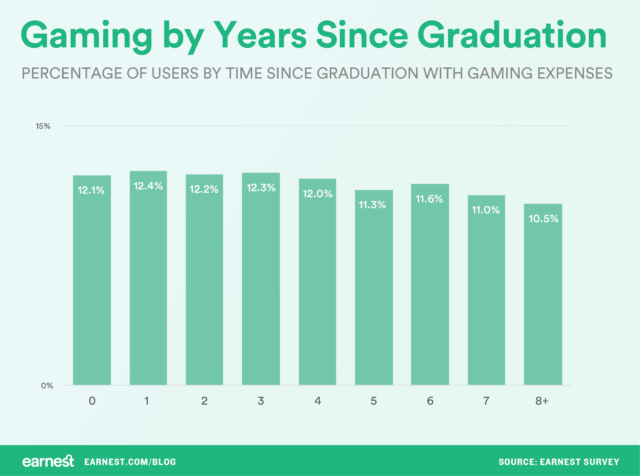 The percentage of gamers slightly decreases as time since graduation increases, following a similar pattern as age. Applicants further into their careers are a bit less likely to make video game purchases than those fresh from graduation. Next, we measured the percentage of male and female applicants who make video game purchases. 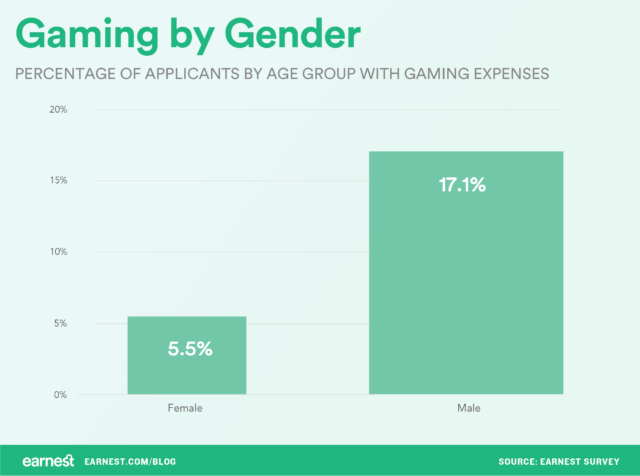 In our data, male applicants are more than three times as likely to have made gaming purchases than female applicants. While studies have found that about 48% of video gamers are women, only 6% of women identify as “gamers” (in contrast to 15% of men); they may be less likely to be the one purchasing the games. In addition, women may be more likely to play games on social media platforms or apps, which may not have been caught by our transaction keyword filter. In this study, we painted a picture of the modern video gamer by analyzing student loan refinancing application data. We found that applicants who make video game purchases are more likely to be younger, closer to graduation, have high school diplomas or Associate degrees, and be male. Older applicants, those with advanced degrees and female applicants were less likely to be gamers. Video game makers may have untapped audiences in older individuals and women – and dentists.